David Baker is the Henrietta and Aubrey Davis Endowed Professor in Biochemistry, Director of the Institute for Protein Design, Investigator of the Howard Hughes Medical Institute, and adjunct professor of Genome Sciences, Bioengineering, Chemical Engineering, Computer Science, and Physics at the University of Washington. He received his Ph.D. degree in biochemistry with Randy Schekman at the University of California, Berkeley and did postdoctoral work in biophysics with David Agard at UCSF. His research group is focused on the prediction and design of macromolecular structures, interactions and functions. Dr. Baker received young investigator awards from the National Science Foundation and the Beckman Foundation, and the Packard Foundation fellowship in Science and Engineering. He has also received the Irving Sigal Young Investigator award from the Protein Society and the Overton Prize from the International Society of Computational Biology. 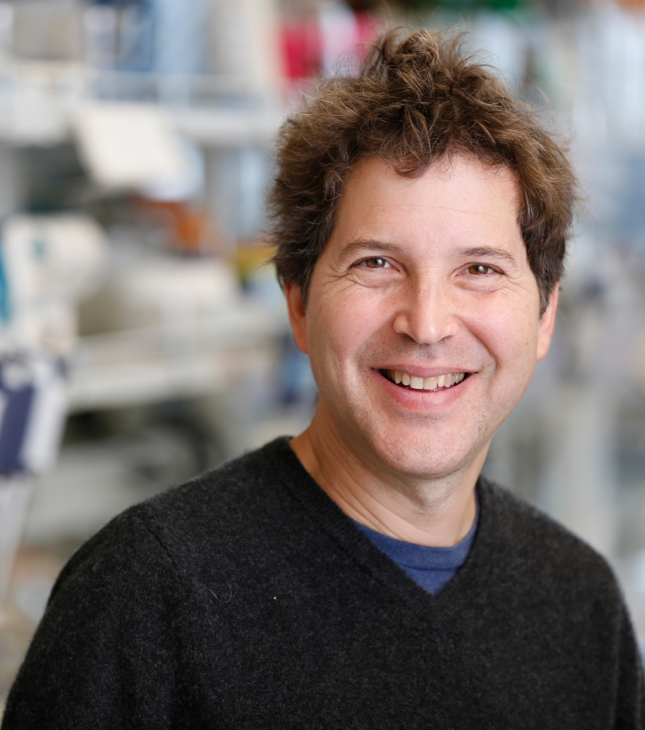 He is a recipient of the Feynman Prize from the Foresight Institute, the AAAS Newcomb_Cleveland prize, the Sackler prize in biophysics, and the Centenary award from the Biochemical society. He is a member of the National Academy of Sciences and the American Academy of Sciences. His research group is a world leader in computational protein design and protein structure prediction. Our research is focused on the prediction and design of protein structures, protein folding mechanisms, protein-protein interactions, protein-nucleotide interactions, and protein-ligand interactions. Our approach is to use experiments to understand the fundamental principles underlying these problems, to develop simple computational models based on these insights, and to test the models through structure prediction and design. We strive to continually improve our methodology by iterating between computational and experimental studies. (i) We used computational protein design methods to create an artificial globular protein with a novel fold. Experimental characterization of Top7 showed that it is extremely stable, and the x-ray crystal structure is strikingly close to the design model. These results suggest that new proteins can be designed with atomic level accuracy, and current work is aimed at using these techniques to design new proteins with novel functions. 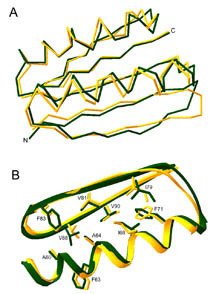 Comparisons of the Top7 design (green) and x-ray structure (yellow). (A) C-alpha overlay. (B) Overlay of core sidechains in the C-terminal portion. (ii) We have redesigned protein-protein interaction specificity and demonstrated that the specificity changes hold both in vitro and in vivo. 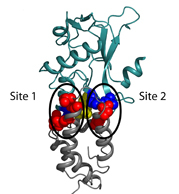 Backbone schematic of the colicin E7 DNase (teal) / Im7 Immunity protein (grey) complex. Important interfacial residues are shown in spacefill (E7 in red, Im7 in blue, conserved Tyr-Tyr motif in yellow). (iii) Ab initio protein structure prediction. We produced de novo structure predictions of unprecedented accuracy in the recent CASP4 and CASP5 international blind tests of protein structure prediction methods. A more detailed description of our research can be found at http://depts.washington.edu/bakerpg. David Baker’s conflict of interest management plan is provided by UW and HHMI. ARZEDA Seattle WA 2009 (2009-present, F, A) Enzyme design engineering for agribusiness and fine chemicals. PvP Biologics Seattle WA 2013 (2013-present, F, A) Designed enzyme therapeutic for celiac disease. Cyrus Biotech: Seattle WA 2014 (2014-present, F, A) Cloud based software for biomolecular design. Cue Biopharma Boston MA 2014 (2014-present, A) Biologic immunotherapies. Icosavax Seattle WA 2017 (2017-present, F, A) Designed protein nanoparticle vaccines. Neoleukin Therapeutics Seattle WA 2018 (2018-present, F, A) Designed proteins immunoncology. Sana Biotechnology Seattle WA / San Francisco CA / Boston MA 2018 (2018-present, F, A) Creating and delivering engineered cells as medicine for patients. Lyell Immunotherapeutics: Seattle WA / San Francisco CA 2018 (2018-present, F, A) Developing engineered T-cells designed to eliminate solid cancers. A-Alpha Bio Seattle WA 2018 (2018-present, F, A) Developing a fundamentally new way of supporting safer drug discovery. PvP Biologics: Seattle / San Diego based company focused on the development of oral enzyme therapeutics for celiac disease, computationally designed enzymes that breakdown gluten in the stomach. Cyrus Biotech: Seattle based company commercializing a user friendly Rosetta GUI for computational protein structure prediction and design – software as a service in the cloud solution for biotechnology and pharmaceutical research. Icosavax: Seattle based company focused on development of a designed protein nanoparticle vaccine for respiratory syncytial virus (RSV) and other infectious diseases. Neoleukin Therapeutics: Seattle based company developing an array of new proteins that activate the immune system to attack the worst types of cancer. Lyell Immunotherapeutics: Seattle / San Francisco based company developing engineered T-cells designed to eliminate solid cancers. Sana Biotechnology: Seattle / San Francisco / Boston based company creating and delivering engineered cells as medicine for patients. A-Alpha Bio: Seattle based company developing a fundamentally new way of supporting safer drug discovery. Rosetta Licensing is manged by UW CoMotion, and royalty proceeds are managed by the Rosetta Commons. Rosetta software has been licensed to numerous non-profit and for profit organizations.